Dignity for All is a multi-partner, non-partisan campaign co-organized by Citizens for Public Justice and Canada Without Poverty with a vision to create a poverty-free and more socially secure and cohesive Canada. Since the inception of the campaign, we have consulted with over 700 organizations and groups across the country, garnering support from over 11,000 individuals who believe that Canada needs to address the complex issue of poverty. In early 2015, the Dignity for All campaign took a huge step towards achieving our goal of creating a model anti-plan. 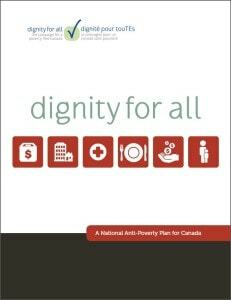 The Dignity for All: A National Anti-Poverty Plan was developed through a consultation process with people from coast-to-coast-to-coast, including people with a lived experience of poverty and includes six key policy areas with recommendations, such as housing, income security, and jobs and employment. Learn more at the Dignity for All website. Click here to download the plan in English. En français.